Next to train station (Hbh), but quiet. Enough room. Tourist office outside train station sells bus/streetcar tickets. It not far from the Altstadt, just a 15-min walk. It's also quite considering it's inside the central station. I really enjoyed my stay there. Close to the train station and staff very friendly. extremely clean and comfortable which I loved. Location by the central train station, luggage storage, room was excellent, bathroom was spacious, everything was clean, staff was efficient and helpful, and it was relatively quiet. This is a "value" hotel... the room was well maintained, clean and comfortable, and it is a great location for arriving, departing and heading out for Heidelberg sight-seeing; however, it is just a very basic (small) room with an exceptionally small bathroom. I would stay here again but I wanted luxury travelers to know that this is just a basic place to sleep and shower and if you are used to a spacious, double-sink bathroom with a soaking tub, you will be greatly disappointed. Breakfast was not included in our stay but we did eat here once; it was definitely a good breakfast. it is a standard IBIS hotel, plain and convenient. If you travel by train or bus this is one of the best because it is right next door to the station. Breakfast is good enough, nothing fancy. The room is clean and air conditioning (this helped a lot since the weather was quite warm). ibis Heidelberg Hauptbahnhof This rating is a reflection of how the property compares to the industry standard when it comes to price, facilities and services available. It's based on a self-evaluation by the property. Use this rating to help choose your stay! Situated beside the Heidelberg Main Train Station and providing free parking, this 2-star hotel is a perfect base for exploring the Heidelberg's romantic Old Town, Heidelberg Castle and the surrounding countryside. The ibis Hotel Heidelberg has comfortable rooms spread over 8 floors. There is a 24-hour front desk and a free internet terminal in the lobby. Wi-Fi is free in all rooms and all public areas. The large breakfast buffet is served between 4 am and 12 pm each day. The air-conditioned bistro bar serves a range of coffees and snacks, and drinks and snacks are available 24/7 in the lobby. Trains, S-Bahn light rail and trams are right outside the hotel, providing quick connections to Heidelberg Castle and Mannheim. The ibis Heidelberg is also an ideal base for exploring the Neckartal-Odenwald Nature Reserve or enjoying boat trips through the Neckar valley. 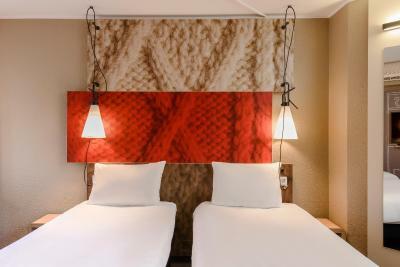 When would you like to stay at ibis Heidelberg Hauptbahnhof? Room features satellite TV, a desk, and private bathroom with hairdryer. These rooms are equipped with 2 single beds. The ibis brand is the European hotel economic leader. And simply because ibis offers you the best value for money. Modernity, comfort and design are the three strong challenges that ibis and its team tends to reach every day, and this at the better price possible. The new innovative bedding, the Sweet Bed by ibis™, a comfortable and convenient room, and a team at your disposal 24h hours on 24: that is why we all love ibis hotels. Its 1 068 hotels spread over 64 countries are just waiting for you. House Rules ibis Heidelberg Hauptbahnhof takes special requests – add in the next step! ibis Heidelberg Hauptbahnhof accepts these cards and reserves the right to temporarily hold an amount prior to arrival. too small for 2 persons. Part of the hotel was under refurbishing and was noisy. A bit far from main town facilities! Convienient for station. Good value, bar was good. The bathroom was very, very small. Furthermore, not enough towels were provided. It was also very loud in the morning, right outside the window. Quite a ways from main tourist section of town. 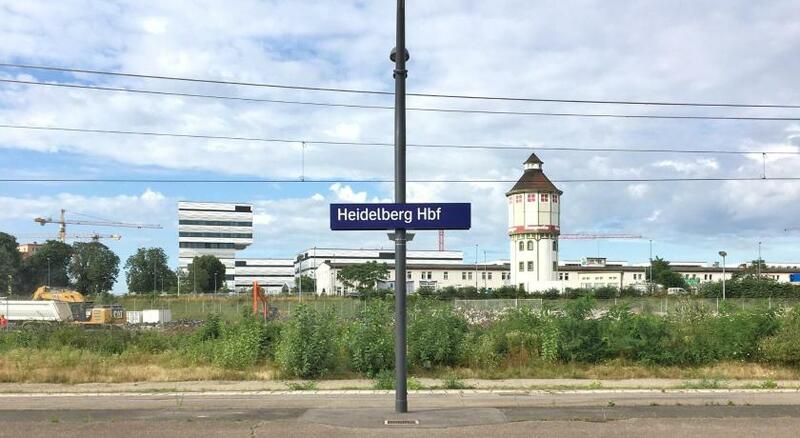 Perfect location if you arrive in Heidelberg by train. We checked in early, dropped off our bags and walked towards the old town with ease. Just know that the old town is about 30 mins away by foot. Location was the best. Train, Visitors Information and local bus within steps. Staff great and facilities were in great shape. there were construction works in the afternoon, which is something that should probably be mentioned on the booking for the period of work. Luckily it stopped early enough. The person at the bar at night was very friendly and hard working. Prepared drinks and foods for us and treated us very well.